The territories of the Turkmen was a large swathe of central Asia, largely unmapped, until it became focus of the Great Game between Britain and Russia in the mid to late 1800's. However, by 1894, the territory was well under Russian control, and a policy of Europeanisation had begun. In 1917, the Russian Empire collapsed, and the Soviet Union was born. Turkmenistan was absorbed into the central Asian region of the Turkestan Autonomous Soviet Socialist Republic. However, in 1925, it was reorganised, and split up. Out of this, the Turkmen SSR was born, taking the borders that Turkmenistan uses today. The first flag of the Turkmen SSR was the Soviet banner, with TSSR in gold in the upper hoist corner. However, in the 1930's, they opted for a flag similar to the Soviet flag, with a larger hammer and sickle. Then, in 1953, they brought in a new flag. 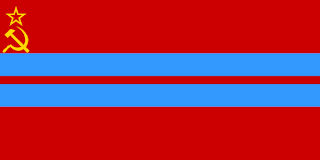 Again, taking the Soviet banner, but this time, adding 2 light blue stripes running horizontally through the centre of the flag. This banner was used until Turkmenistan's independence. 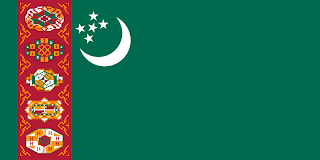 A new flag was created when Turkmenistan declared independence from the Soviet Union. In 1992, the new flag was a green field, with a red stripe near the hoist side, with a crescent and 5 stars just on the fly side of the stripe. 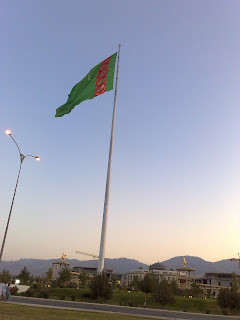 The red and green are historically important colours in Turkmenistan, with the crescent symbolising hope. 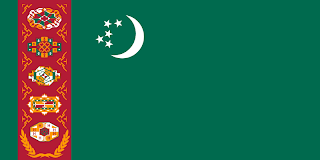 The 5 stars represent the 5 provinces of Turkmenistan. On the stripe are 5 carpet designs. Again, taken to represent each of the 5 provinces. Upon independence, the former Soviet leader, Saparumat Niyazov stayed in power, and slowly solidified his grip on power, building a cult of personality round him, as well as styling himself as Turkmenbasy, or "Father of the Turkmens." In 1997, he altered the flag, by shrinking the crescent and 5 stars down, and adding a wreath to the bottom of the red stripe, more as an afterthought. This was to represent Turkmenistan's policy of permanent neutrality. Then, in 2001, the final amendment was made to the flag. This time, adjusting the designs on the red stripe, so that they more fully covered the stripe, stretching from one side, to the other.